So I kind of skipped over this in Part 2, but I wanted that to be about the race. Here’s what happened AFTER I crossed the finish line, my post-race indulgences, the drive home, and my final thoughts and feelings about the race. If you missed what happened BEFORE the race, check it out here. If you missed what happened DURING the race, look here. First of all, crossing the line was a little bittersweet because of my finish time, but it was still amazing. I heard the announcer say, “Here’s Todd Buckingham from East Lansing!” I made sure to put myself in a good position, without anyone else around me, so I would have a good race finish picture and I gave a little fist pump as I crossed the line. After crossing the line, I finally allowed myself to walk (duh, I’m not going to keep running after I finish!) The finish chute was SO long though! I had to walk 4 blocks just to get through the food, water, and medals. Speaking of medals, there were volunteers handing them out and I spotted a nice lady in a Red Sox hat and had her put the medal around my neck. After she did, I gave her a big hug and she said, “Oh my gosh, thank you so much! That was my first sweaty hug all day!” I didn’t tell her that I had just dumped water over my head and it wasn’t sweat, but I was glad to make her day. Always supported by my parents. Sometimes figuratively and other times literally! King Cakes: just look at those things! I wish I would have been hungry enough to enjoy them. Before the race, we had planned to eat lunch at The Friendly Toast, a great little breakfast place with some of the most delicious pancakes I’ve ever read about! Because let's be real: the whole reason I run so far is so I can eat all the goodies! I was planning to get the “KING CAKES”- two “mini” pancakes with bananas & chocolate chips inside & peanut butter in between, with real whipped cream on top; encircled by a side of bacon (or turkey or vegetarian bacon, but Elvis will roll in his grave) according to their website. Unfortunately, my stomach is always bigger before a race than it is after. It was really upset and I wasn’t hungry at all. I ate a PowerBar gel at mile 6 and mile 12 of the race and drank water and Gatorade throughout. While I had planned to eat another gel at mile 18, I decided not to because I didn’t think it would make much of a difference. I was running so slow that my body was using predominantly fat as fuel anyway so it really wouldn’t have helped to take in more carbohydrates. It was right around mile 17-18 that my stomach was REALLY upset too and I thought I was going to throw up. I did one of those burps where you kind of throw up in your mouth (I think it’s called a vurp? :P) Gross, I know, but it happens. Moral of the story was that I really wasn’t hungry enough for the King Cakes after the race. We did go right next door to Flour Bakery just to check out what they had and they gave me a free mini-cupcake just for finishing the race! WIN! After making the short walk to the train station, we hopped on board and made the trip back to our hotel. They were giving marathon runners free rides today so another WIN! My legs were still really hurting though. So while I was sitting on our seat, I put my legs across mom and dad’s laps and they tag-teamed a massage on my quads (mom) and calves (dad)! This seriously made them feel so much better. Beforehand, I couldn’t even sit in the seat without feeling like they were going to cramp up at any second and after…well let’s just say that I could almost sit like a normal person haha. We got back to the hotel where I had a special treat waiting for me. We had driven up to Framingham the day before the race and picked up a cinnamon roll from the Framingham Baking Co., a little hole-in-the-wall (or should I say basement) place. After giving my stomach a little time to calm down on the trip back to the hotel, I was able to enjoy my post-race cinnamon roll. Even though it was a day old, it was still soft and definitely hit the spot. After I showered and got cleaned up, we started our drive back home. I was glad to have my Roll Recovery R8 in the car with me to roll out a bit because I felt like a baby giraffe trying to walk! Walking down stairs, stepping off a 3 inch curb, and trying to sit down are my worst enemies! We did get out and stretch our legs at Niagara Falls and it was an amazing site to see. I was just in awe at the beauty and the sheer power of the falls. I did get to enjoy my cookie that I picked up from Bakery on the Common on Saturday and it was one of the better cookies I’ve had. 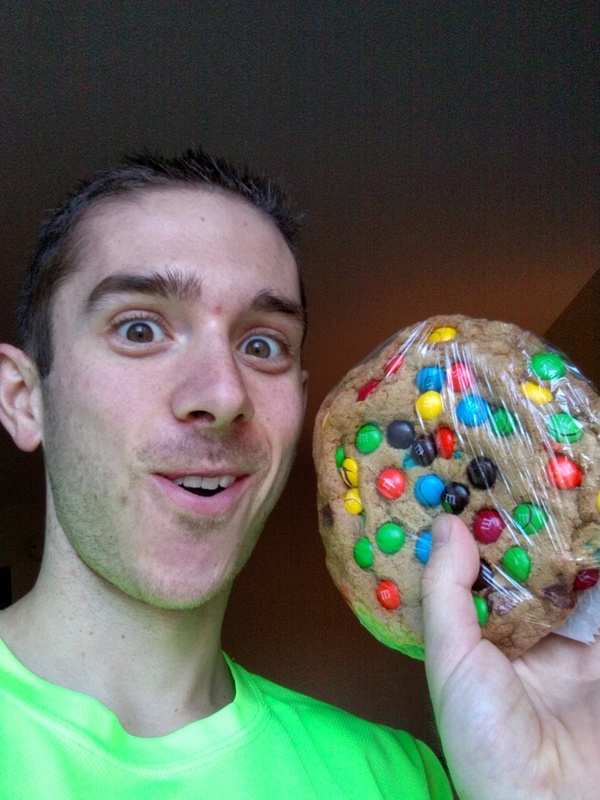 The cookie was soft and the crunch of the M&M's made it the perfect combination! We also stopped at Denny’s for dinner and I enjoyed some pancakes, eggs, and BACON! Mmmm. Bacon. Then as we were driving back through Port Huron, we made another quick stop at Dan and Laura's. 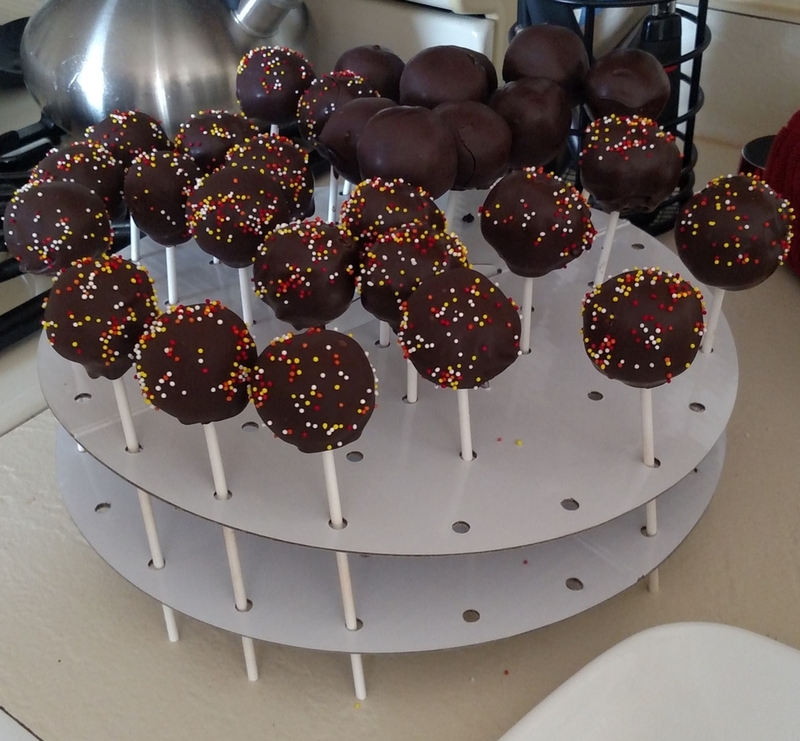 Laura had some cake pops waiting for me AND she saved me the spoon to lick! What did I tell you before? Best. Friends. Ever. And to top it all off, when I got home, I had these scrumptious little treats waiting for me courtesy of Nick at Rise Grand Rapids. Seriously you guys, if you’re in Grand Rapids, or even just passing through, you HAVE to get in touch with him to get some of his treats. Soooo good! So how do I feel about the race? After having a few days to digest what happened with the race, I'm going to do my best to describe how I feel. This was the first time in 5 attempts at the marathon distance that I didn't set a PR (Bayshore 2013- 2:40:24, Bayshore 2014- 2:33:54, Grand Rapids 2014- 2:33:45, Bayshore 2015- 2:28:37, Boston 2016- 2:50:02), which was bound to happen eventually, but I didn't think it would be to this extent. I'm going to try and be honest with you all (and myself) and put into words what I've been thinking. It's difficult to put into words, though, because it's tough to understand if you haven't gone through it, but I'll do my best. Thank you for being understanding of my situation and know that I really do appreciate all of your support. Keeping that in mind...Everyone keeps congratulating me and saying how fast I was. This honestly stings a little bit because, the truth is, I was actually REALLY slow for me. The slowest I've ever been in a marathon by 10 minutes. When people congratulate me, I do my best to smile and say thank you, but all I think is "Congratulations for what?" Sometimes I verbalize this and the usual response is, "You finished the Boston Marathon!" Yes I did. And it is a very prestigious race. I take nothing away from anyone who finishes a race like Boston or any other race for that matter. However, I am not satisfied with just finishing a race. I know that I'm my own toughest critic and it may seem unreasonable that I can't be satisfied with running a marathon, the Boston Marathon, in 2:50:02, but I'm not. I qualified for the race with a time of 2:28:37 and was the 40th fastest amateur based on qualifying time (that's why I'm number 140). I'm not satisfied because I expect more of myself. Imagine working toward something for 6 months. Let's say it's a big presentation at work, or a tough exam at school, or even a Christmas bonus (Clark Griswold anyone?!) Now imagine that after those long 6 months and putting in countless hours of work (or in my case, 364 hours...yes, I actually trained that many hours), that what you set out to accomplish didn't happen. Not only did you not meet your goal, but you fell EXTREMELY short of that goal AND you have people congratulating you for it. It would be like studying for a test like the ACT, sitting through the ~4 hour test expecting to score a 34, actually scoring a 28*, and having people congratulate you. Not exactly "Congratulations" worthy for someone expecting such a high score. Yes, many people would be very happy with a 28 on the ACT (or a 2:50:02 marathon) and they should be because it's a great accomplishment. But when I expect so much of myself, it's just a let down. It may sound stupid, but that's where my mind goes when people congratulate me. I know that when they do that they mean well. So instead, I just try to smile, say "Thank you", and change the subject because I don't feel like I deserve it. * I wanted to finish in the top 50 overall. Out of 27,487 runners who started the race, that would put me in the top 0.2% (or scoring a 35 on the ACT). Of the 4,946 males ages 18-39, 50th would still put me in the top 1% (34 on the ACT). Instead I finished 490th of 26,639 finishers, putting me in the top 2% (32 on the ACT). I also finished 391st of 4,807 males ages 18-39, which puts me in the top 8% (28 on the ACT). So going from a 35 down to a 32 overall or from a 34 to a 28 amongst my peers (more applicable to the ACT reference). I also wanted to finish in a time of 2:25:00, but actually finished in a time of 2:50:02. That's a 15% difference from expectation to performance. So the equivalent would be if I expected to get a 30 and actually got a 25. Now do you remember those goals I talked about in the DURING post? In particular, I'm referring to the one where I wanted to finish as a top 10 American. Well another reason I'm so disappointed is that this goal could have been made a reality and I didn't even need to run a 2:25:00. Even if I ran the time I qualified for Boston with (2:28:37), it would have put me as the 8th fastest American. I know that most of the top Americans weren't running because they just run the Olympic Trials in February, but nobody else needs to know that ;) What I decided is this: I don't care if the top Americans will be back for next year's Boston or the year after that. I am STILL going to finish in the top 10 Americans, even with those guys racing and that will make it even sweeter. My brother gave me a good quote that I thought I would share: "Boston 2016: Enjoy. Boston 2017: Destroy." Right now I'm not sure if I will go back in 2017, but I will go back eventually. I am nowhere near satisfied with my effort and I will be back for redemption! But for now I'll settle for a doughnut...or two :) Thanks again for following my journey and for all your support. Well that about wraps it up. If you missed parts 1 or 2, just click here or here!